In 1919 and again in 1922, a medium named Franek Kluski succeeded in proving “conclusive evidence that spiritual matter exist” through experiments at seances conducted under strict controls. 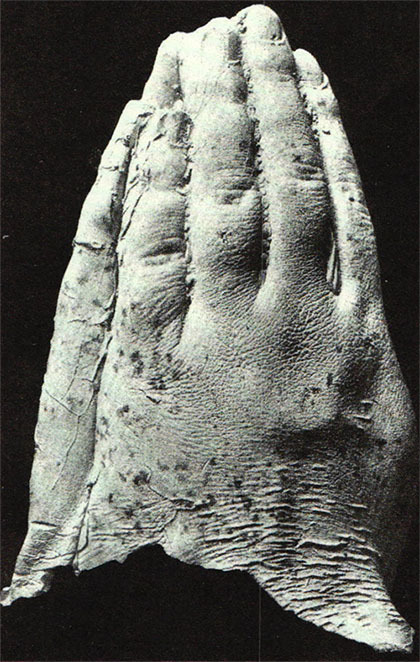 This evidence is what is called Kluski’s moulds of spirit hands; an exquisite hand mould made of wax. 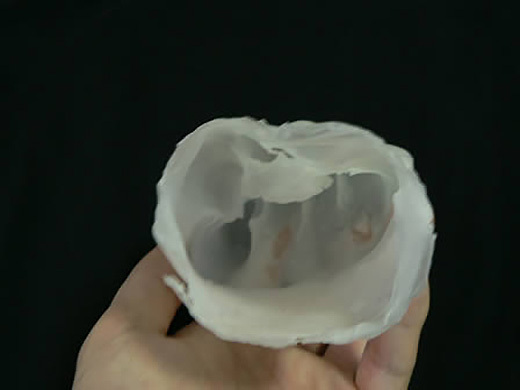 * Then, to hold the shape, researchers poured the plaster into the wax mould and then took off the wax. 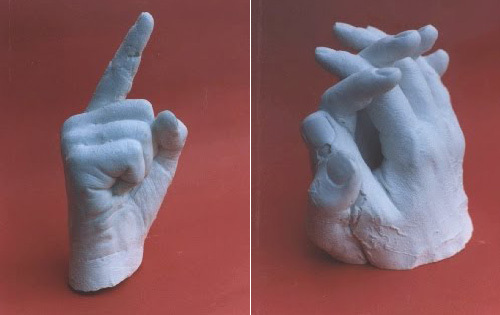 These are the final forms of the so-called Kluski’s moulds of spirit hands. The wax moulds are so delicate, that it is impossible for anything made of actual material to be pulled out from the moulds with the fingers gripped in a complex form or with the whole hand from the thin wrist without breaking the mold. This could be achieved only by something like a ghost that can immaterialize. When the experiment was carried out, two participants sitting next to Kluski grabbed both his hands, so he could not move or use them. In addition, to identify if different wax or finished wax moulds were brought in and swapped, a very small amount of test reagent had been added to the wax in secret just before the experiment started. By cutting off a part of the wax hand mould after it was finished and adding another chemical, it turns red if it was made with this reagent added wax. Thus, the researchers were able to prove that the mould was made in the room with the wax. This test was done successfully and the wax turned red; it proved that Kluski did not bring into the room a mould made somewhere else and no alternations were made. After Kluski’s moulds appeared, for nearly 80 years, researchers and skeptics have been seeking for a method to re-create this mould. Some methods were too complex or some moulds were too clumsy compared to their struggles, and therefore, the method of making moulds remained an unsolved mystery for many decades. 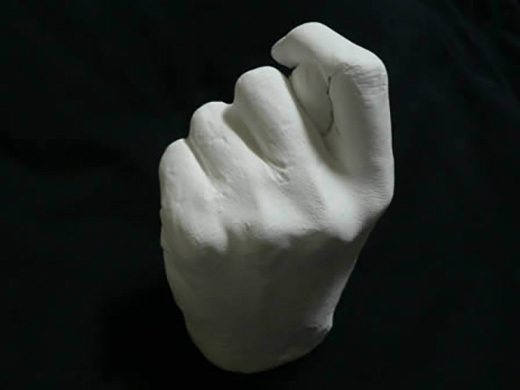 However, in 1997, two Italian skeptics, Massimo Polidoro and Luigi Garlaschelli succeeded in re-creating wonderful Kluski’s hand moulds with a method. The method turned out to be very simple. You don’t have to be a ghost to pull out your hands from moulds without spoiling it if you work carefully and slowly. The most important thing is, it seems, to change your belief that this is impossible for human. 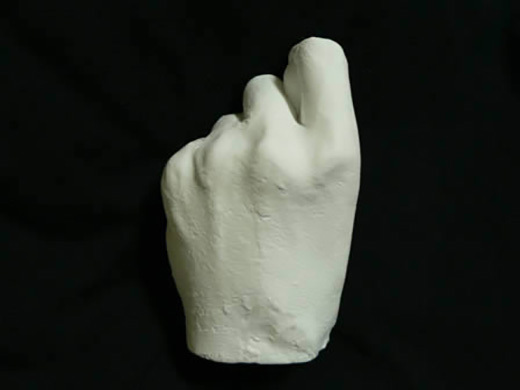 However, in their reproduction report, they did not include a photo of the wax hand mould before pouring plaster in. I thought it was lacking some in persuasion. 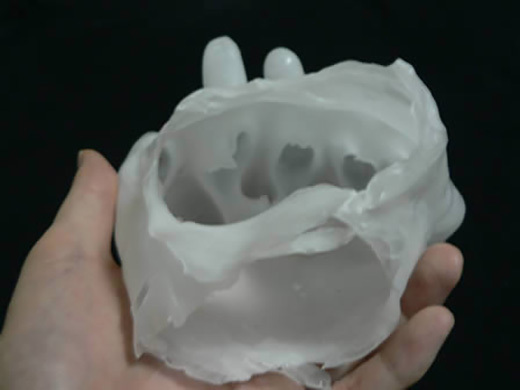 More than that, I was very interested in making this hand mould for myself, reading that this experiment did not require very much special equipment. So I decided to carry out this experiment. To give the results first, after a process of trial and error, I can say that I have succeeded. As the report says, and as the skeptics suspected, humans could have made the moulds. The following is my report of the process for making the mould, with photos included. I also will describe the mystery of how mediums got their hands free while it looks impossible because people next to them were holding his or her arms. Not only did this take place in the seance carried out by Kluski, but it was also often performed by many mediums in the late 19th century to show a spiritual event taking place while both hands were held by two people. It looks like the ideal proof that the mediums could not move their hands and that anything that happened was done by ghosts or spirits. We must remember, however, that most seances were done in the darkness with out any light. The members could not see each other and they could only depend on their tactile senses. Under these conditions, if you can make them believe that someone is holding the medium’s hands, this will be an important key to unbridling. Are there any tricks to make people believe that they were holding the medium’s hands without doubt, while they did not actually doing so? This trick actually exists. 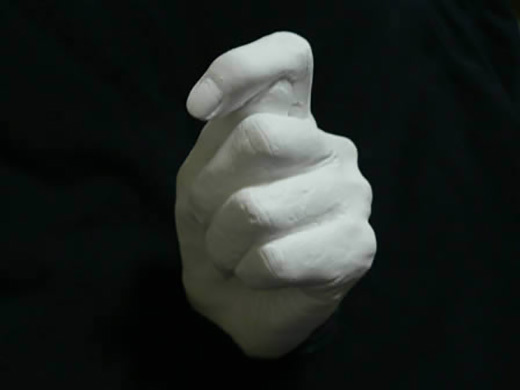 The process is as follows: the medium keeps both of his or her hands together. Then pretending to call the spirits, the medium shakes or trembles, and while doing so, shakes off the hands of the bridlers for a moment, as if their hands slipped off. The bridlers try to make sure they’re holding the hands of medium, but now he or she is made to grab the hands of the person sitting next to the medium. Please look at the illustration below. The details in the two pictures are different: one has only one hand and the other has both hands free. In one case, the hands are touched by fingers, and in the other picture, the hands are being held by the writs, but the basic method is the same as what I described above. These are tricks uncovered by skeptical Richard Hodgson who belonged to the Society for Psychical Research by attending a number of seances. It was the routine of seances that all hands were freed just before the light in the room was lit, and, therefore, those who sat next to the medium made believe that they were holding the medium’s hands until the end. The materials and equipments you need to prepare are the paraffin wax, hot and cold water in large buckets and a water temperature gauge. These are same as that were used in Kluski’s actual experiments. First of all, I must make some remarks on the kinds of waxes I tried. According to their melting points, there are several kinds of waxes and I first used most common wax to the experiment; the one with 55℃ melting point. I didn’t expect it to be so hot that I could not try but once with it. Then I lowered the temperature to 52℃ to try again and still it was too hot. After this first experiment, I found out there are waxes with lower melting points and decided to use one of them to the next experiment. 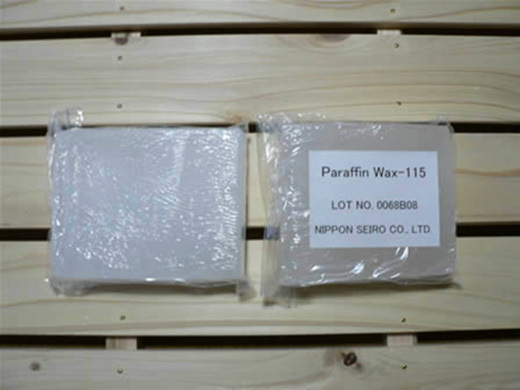 In the photo, the one on the right is the wax; “Paraffin wax 155”. The melting point is 48.5℃ and this will cause no problem. I carried some research if Kulski used this kind of wax with lower melting point, but could not get a clue about it. However, even if he had used a common wax, I must conclude that the temperature is not a major problem on this experiment. As I get used to it in my first trial, I could stand up to 52℃, and in the report of Polidoro who recreated the moulds for the first time, he had not mentioned that 55℃ is too hot. What temperature is appropriate depends on the personal potential and by the result of practices. For the “Paraffin wax 155”, I would like to give acknowledgement to Nippon Seiro Co., Ltd. who donated this product to me when I inquired about the wax describing the method. 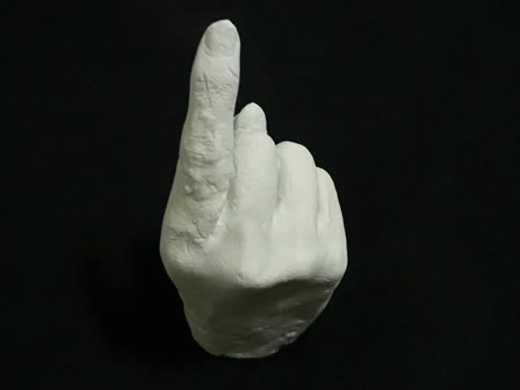 When you are making moulds, you must decide the shape of hand you want to make before putting your hand in the melted wax. When the water temperature get down to around 50℃, hold your hand tight and put it into water wax mixture. If the wax would not cover your hand fully try two or three more times. The photo shows the wax covered hand pulled out from the bucket. From here, you have to pull your hand out without breaking the wax moulds. The believers write this process is “impossible for human beings”. However, I now learned by doing it by myself, it actually is possible if you do it carefully and skillfully. First, remove the wax from your wrist rightly. If you are using both of your hand to make moulds, don’t afraid it would break, but just move your writs till the wax remove. Then hold your arm of wax covered hand with the other, just between the writ and elbow, and pull the skin to the direction of elbow. By doing so, the skin attached to the wax is also pulled and it makes easy to remove wax from skin. If you are using both hands, move your folded hands tossing upward. Then move the wax carefully for several times to make thin gaps between the skin and wax. 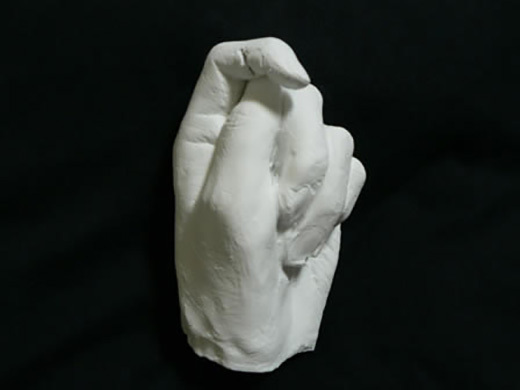 Watchfully and slowly moving your hand/hands and pull it/them out of wax mould, then you are making it, something you think it is impossible intuitive. 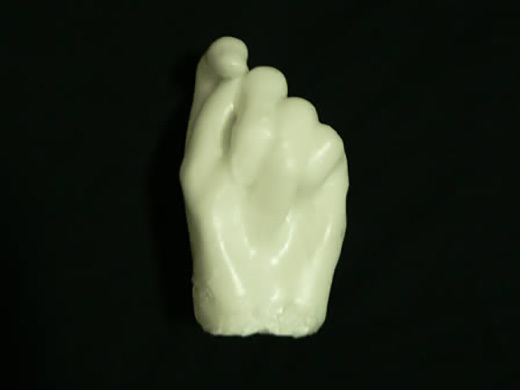 Because wax moulds have certain hardness and human hands have more flexibility, we can make this process possible. 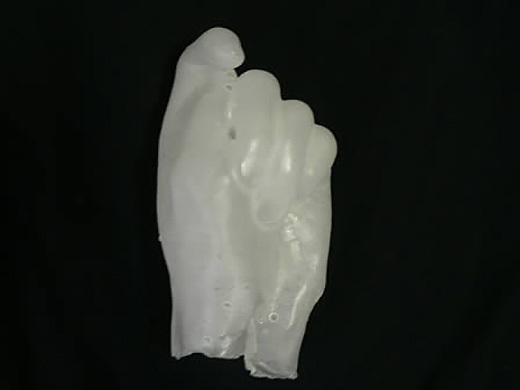 You may still think it is impossible to pull out whole hands through the wrist part thinner than it, even though you can remove each finger from the wax. However this is quite possible by using the method created by Harry Houdini. The wax has a little flexibility before it get cold and fixed completely. Therefore, if you work cautiously and go through the wrist part, the part expands a little and you can pull out your hand without breaking it. I tried actually and confirmed that wrist part would not rip with careful handling. If the writ part have widened a little, then it is possible to fix it rite after you pulled your hand out. Here is the photo of “Wax mould” after your hand is pulled out. The right one is looking inside from the wrist direction. Next, remove the wax covering plaster and you get a “Kulski’s spirit hand mould”. I tried to make more difficult shapes and would like to make reports about them here, too. The first set of photos is hand mould using right hand. The upper left; wax covering hand. The upper right is the moulds after the hand is pulled out shown from the wrist direction. 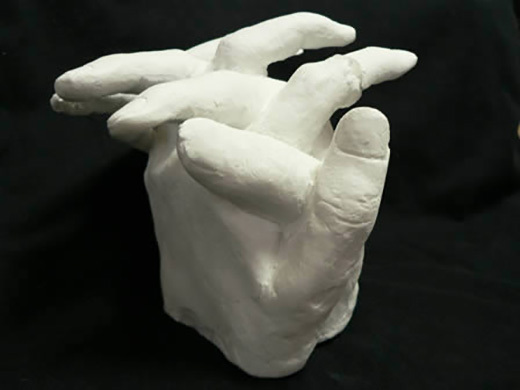 The lower two are finished plaster hands. The next set is the one using both hands. 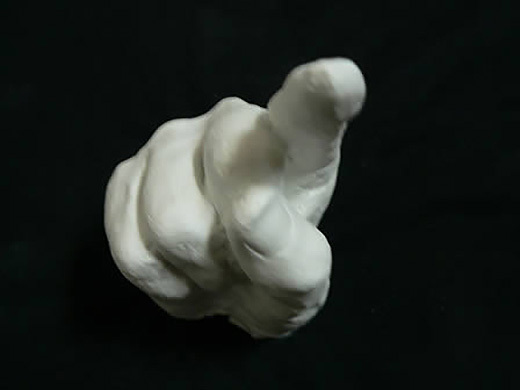 The pointing finger of the plaster model broke while I was taking photo and therefore, I had to fix it with glue. 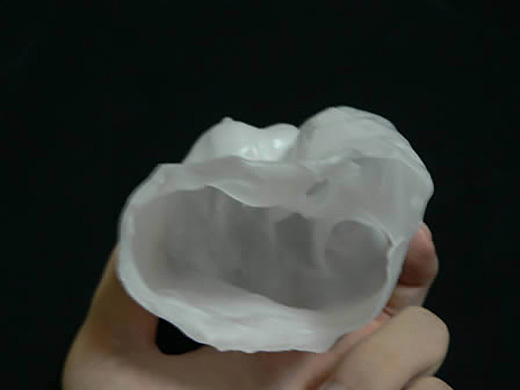 Through the whole experiment, sometimes wax moulds rip opened while pulling my hand out and another time even though I succeeded to make wax mould, I failed to make plaster model. Looking back the episodes, all trial and error was challenging and was enjoyable. I must admit that I learned a lot from this experience. Kulski had carried five experiments; that was carried in November and December of 1919, the one carried in September of 1921 at his home in Warsaw, and again in April and May of 1922. The documents records that he was able to make more complicated and high-qualified models as he repeated experiments and time passes on. He may have been through the process of trial and error. “Secrets of Magic Ancient and Modern” Walter. B. Gibson,.